Every day, swarms of Boston pedestrians scurry from all four corners of the intersection at Boylston and Tremont streets, jostling in the middle of the road like concertgoers in a mosh pit at a heavy-metal concert, as they try to beat the crosswalk countdown signals before the lights turn green and cars begin to go. To alleviate the problem, Bartel and her classmates have proposed a modest solution to city officials as part of a class project: add five seconds to the crosswalk signals, so that people aren’t scrambling to safety in the final moments before drivers hit the gas and the ominous orange hand appears telling pedestrians to stay put. The idea to tack on extra seconds to the crosswalk timers grew out of Emerson professor Catherine D’Ignazio’s Civic Art and Design Studio class this semester. It was one of four transportation-related proposals to improve the congested intersection at the heart of the school’s campus. Students split up into groups that focused on pedestrians, cyclists, drivers, and public transit vehicles. The group tasked with coming up with ideas for improved pedestrian access was made up of Bartel, Kelsey Aijala, and Tori Knoerzer. Currently, three of the four crosswalk signals at the intersection are 24 seconds long. For seven seconds, they display the “WALK” symbol. Then, for 13 seconds, they flash the “DON’T WALK” sign, forcing people to pick up the pace. Finally, the signals show a solid “DON’T WALK” message before traffic then begins to flow. The group’s project calls for the timers to be extended specifically during the 15-minute intervals when students from Emerson appear in droves and move from building-to-building to change classes each day. As students hit the streets, they’re clumped together with people rushing to work or lunch, or to catch an MBTA train, sometimes creating queues that stretch along the sidewalks. And most of the time, a reporter observed on a recent rainy weekday morning, people skirt the four available crosswalks altogether as they shuffle between street corners. To promote their idea, the students have been circulating a petition amongst their peers online, and pushing out the message on social media. They plan to deliver their extensive research and the signatures they collect to city officials by the end of the semester. They’ve even received support for the project from Emerson College president Lee Pelton, they said. But according to the Boston Transportation Department, changes could come sooner than expected. The city already is reviewing traffic signal timing in the area where Boylston and Tremont streets meet as part of a citywide effort, said Commissioner Gina N. Fiandaca. In a statement, Fiandaca said it’s “premature to say with certainty” that the city can meet students’ demands, but officials will review the feasibility of extending the walk cycle as they update traffic signal timing plans. While D’Ignazio’s class sees the need for change, some students remained indifferent. But that hasn’t slowed the student group’s momentum as the semester winds down. They plan to continue to push the crosswalk campaign, and see the project through. 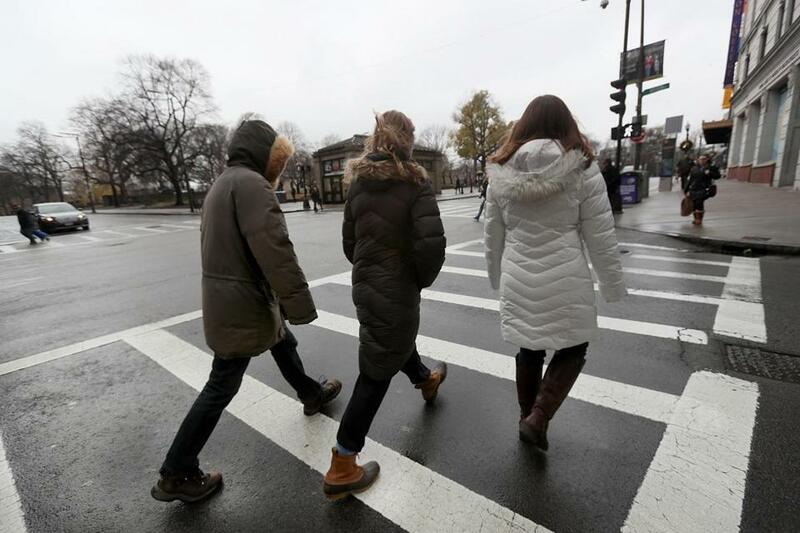 Students at Emerson College are asking the city to add five seconds to the walk signals at Boylston and Tremont streets.